But first, a bit on the past year to start. After a promotion at work, time became even shorter than normal, which was reflected in the posting rate – especially in the second half of the year. Hoping to improve that this year, and although I don’t expect to be able to achieve a post a day (which would be ideal! ), I still hope to achieve at least 200 posts throughout the year, so something like 2 in every 3 days or so. I still have two magazines to feed content to, so if you want some of the longer, build-oriented articles, they are in the pages of ManSpace magazine, and The Shed magazine. There will still be build articles here as well of course, but magazines do add to the cash flow 🙂 Videos on the other hand are still the forte of the web, and what this site was originally set up for. I am expecting a lot more video content to be made available this year, especially with the increasing maturity of my setup. And so to the shed. It has been a really big 12 months, being just past the first anniversary of the new shed. I thought I should look at the shed itself, and how it has held up in the first year. The construction was completed 12 months ago as I mentioned, and before any equipment was moved in, the floor was given an epoxy coating using Shield-crete from Globak Woodcare. So what do I think, 12 months on? 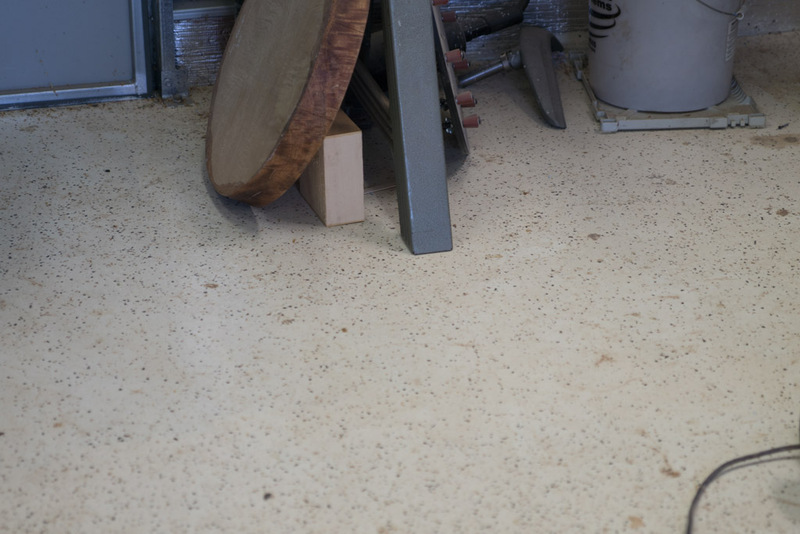 Other than the above photo having quite a bit of surface sawdust from a current project, the floor still looks awesome. It has held up excellently, despite having heavy machinery dragged over it, things dropped on it, spilled on it, glue dripped on it. Sure there are some marks on the surface where I have dragged large machines, but I could probably scrub them off if I could be bothered (it is a shed floor after all). A few scratches that no surface would have resisted (not that I remember where they are, and they are not apparent even so), and a couple of areas that are chipped, but that is because what fell damaged the concrete underneath. The surface itself is still fully adhering to the concrete, so my preparation and application was obviously appropriate! In hindsight, I might have used a few less of the paint chips (my application wasn’t as even as I should have been), and I would have used a bit more of the antislip in the glaze finish. In saying that, the surface is fine underfoot whether clean, dusty or wet. 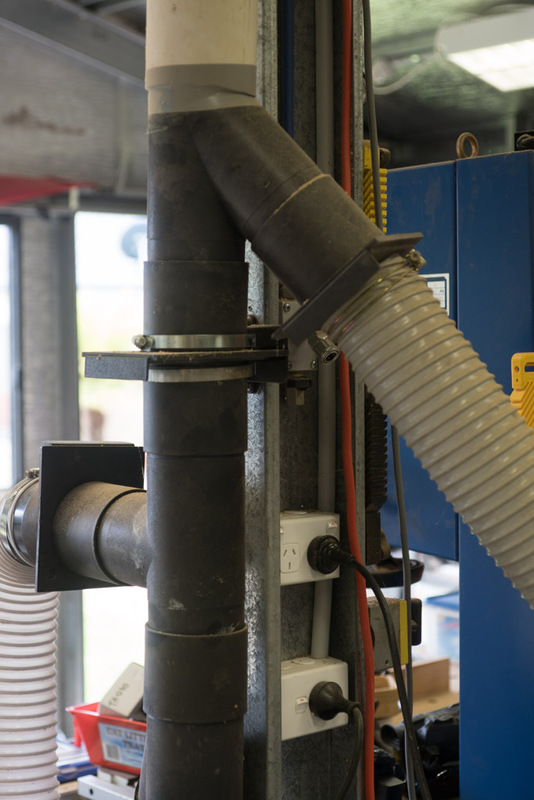 Keeping it clean is easy, either with the dust collector, or a compressed air sweep (or the occasional broom). I might have gone with a darker shade, but that is purely aesthetics. 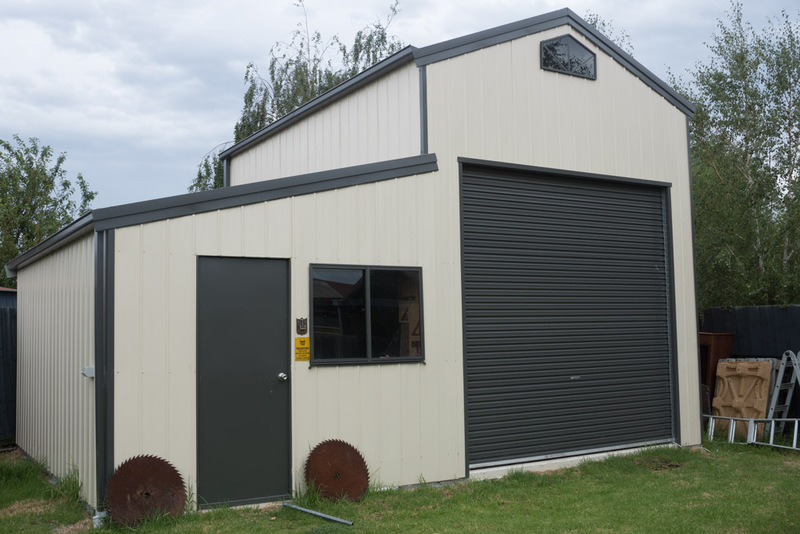 The shed construction has held up to the first 12 months without an issue – it is every bit as robust as it looks. Those beams are solid! The shed has had a few high wind days – not enough to really put it to the test, but there have been no signs of issue with what it has survived to date. 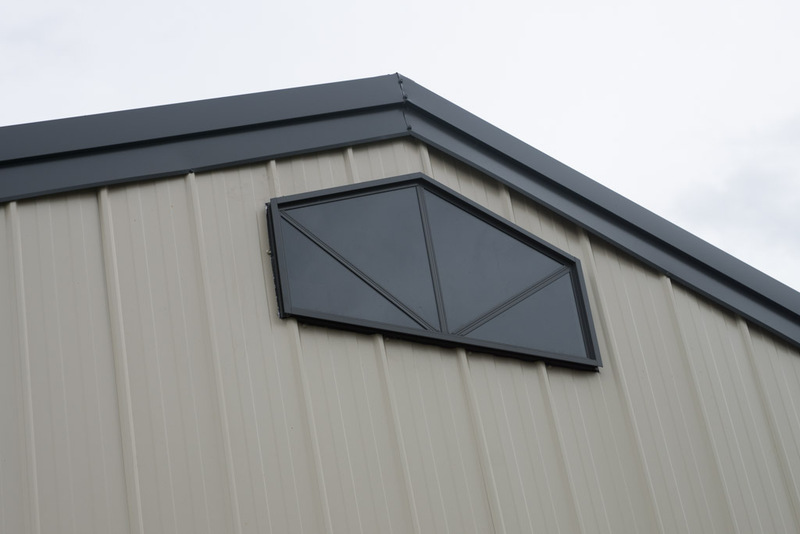 It is a superb structure – puts those lightweight sheds right in their place. Granted there is a significant cost difference. It is worth it. The mezzanine has worked out well too – I haven’t managed to collapse it, and it is still storing a lot of gear up there. No, sadly, I still haven’t finished unpacking. That will be a work in progress for the next few years I suspect! The attic stairs have been a good decision, as well as the crane and hoist. I still need to lower the stairs a couple of inches – I’ll get to it one day. Having a good amount of storage space has helped keep the main shed floor clear and available for the working machines. Having a wood store alongside has been great as well, and although having access from inside the shed would have been better, it is a working solution. 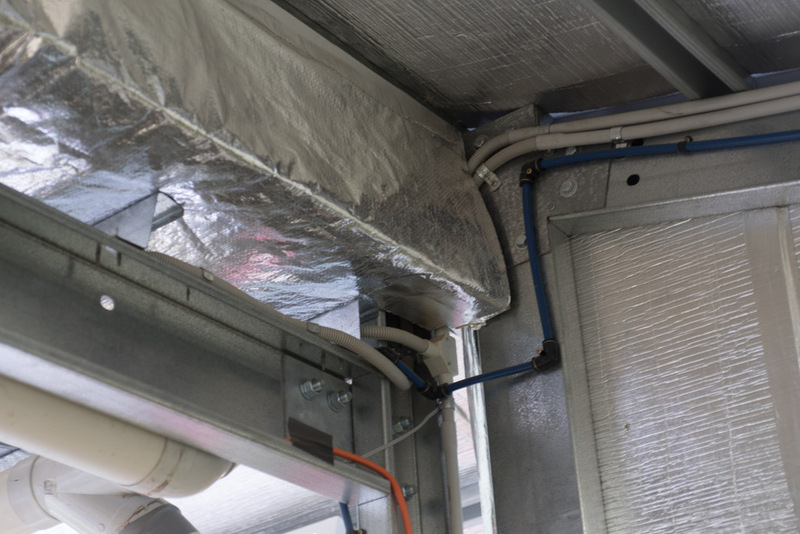 Having a shed with insulation is significantly better than one without, but still, on particularly hot and or humid days, it is not the nicest place to work. The standard insulation could really do with being kicked up a notch, or three. I’m hoping to get some air con working in there at some stage, as well as a working pot belly for winter. 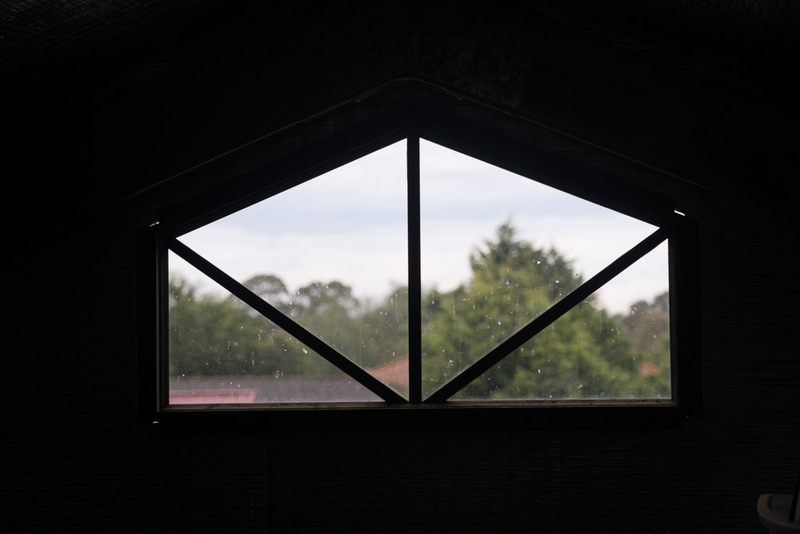 The temperature extremes (not that they are exceptionally extreme in Melbourne) is enough to be detrimental to the shed experience, so more work required in that area. 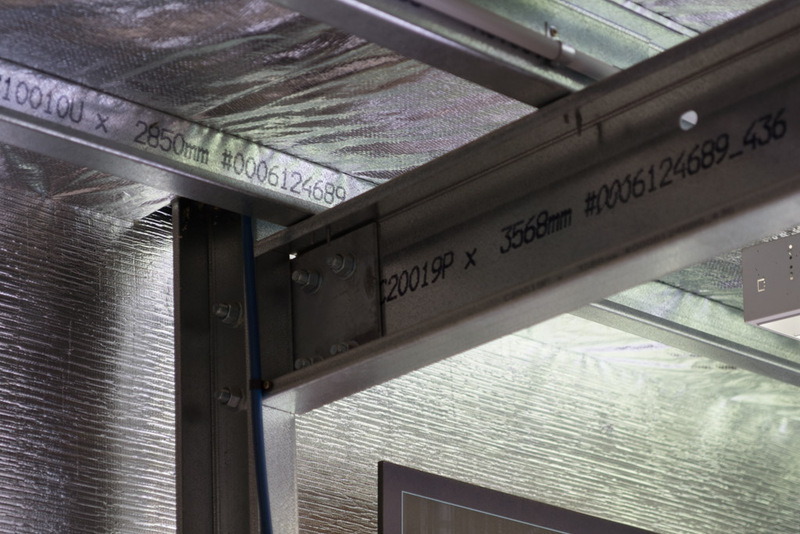 It really wasn’t installed very professionally – rough and messy at the edges, and the tape was slapped on rather than applied properly, so that has been coming adrift in places during the year. As much as possible, and then add more. 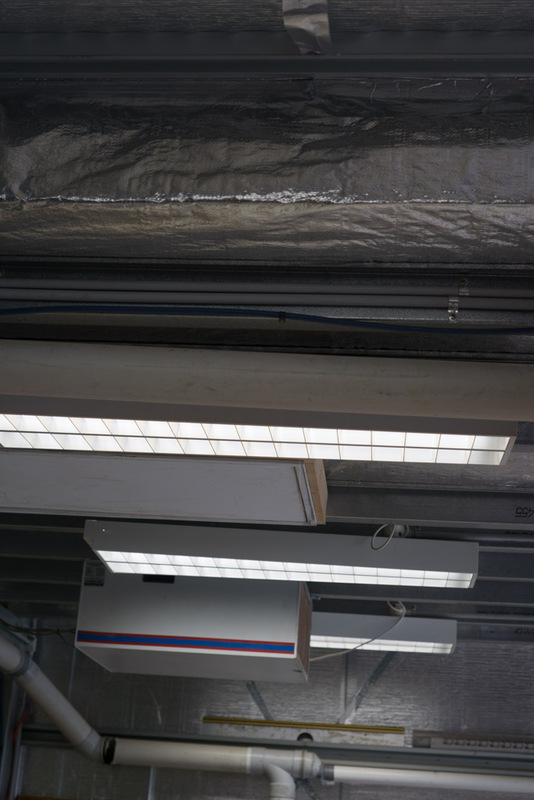 The lighting I have, which is a really comprehensive grid of fluoros (2 per unit) is only just sufficient. Once I replace the tubes I should get a better result. Not that what I have there isn’t good, but there is room for improvement. There are two areas where the design and/or construction is less than perfect. The windows on the mezzanine, and the roller door both let water in. While the roller door could have been improved by having the slab slope away from the door, it would have been too risky to have that done before the shed went in, in case it wasn’t quite in the right place. I could grind it away after the fact, but a. it would look messy, and b. it would wreck the floor coating. The bottom of the door doesn’t seal sufficiently against the concrete, especially in the corners. The mezzanine windows are more of a problem. Whether they are not well made, or not installed correctly I don’t know to say. But any half decent rain with a bit of wind, and there is a bit of a waterfall. Possibly the gaps have something to contribute. Not very clear in the photo, you can just see light coming in at three of the five corners, and the other two are not immune either. I have to silicone them up. In saying that, I now do remember that I wasn’t confident on how the top corner of the roof ridge was finished, rain might be coming in there and running down the insulation, making the window look like it is leaking. Again, it all points to poor assembly. I added the insulation to the door btw, which was a good move. Not only decreasing a significant amount of heat that was coming through the door, but also makes it sound a lot less tinny when it shuts. (I would like to stop so much heat coming through the roller door too, if I knew a solution for that). The door though – the lock/handle mechanism comes loose after a time, needing to be tightened. And the door scrapes more and more over time on the jamb. This is most likely because the frame holding the door is too flimsy, and bends a bit more each time the door is opened, especially if opened too far. There is no active stop on the door to prevent it opening too far, putting pressure on the hinges and the surround, nor is there anything to stop the door slamming shut if blown by a light breeze. Both of these can be rectified obviously. But it should be part of the design, not an aftermarket feature that needs to be added. Given the quality of the rest of the build, this is a small area which lets the otherwise near perfect score down. 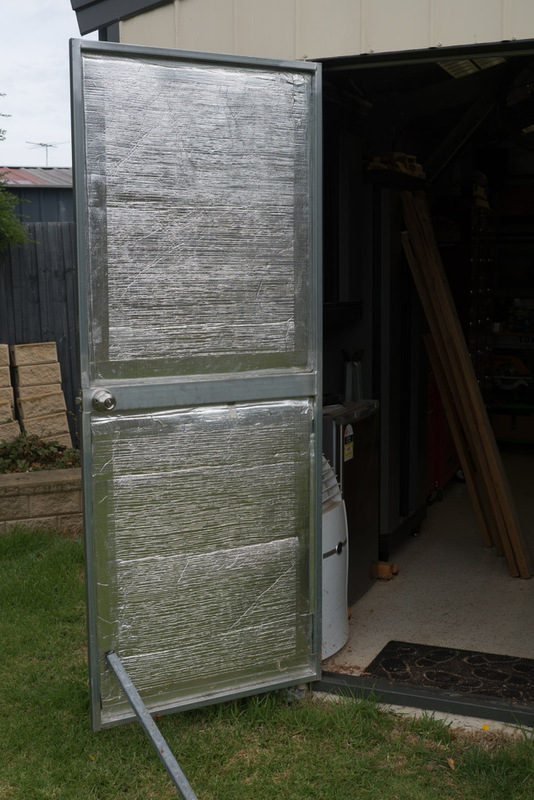 Still, the door is 1000% better than the tin shed doors on the clip-together sheds that are out there. Compressed air – RapidAir setup from Professional Woodworkers Supplies. Having air piped all around the workshop is awesome. 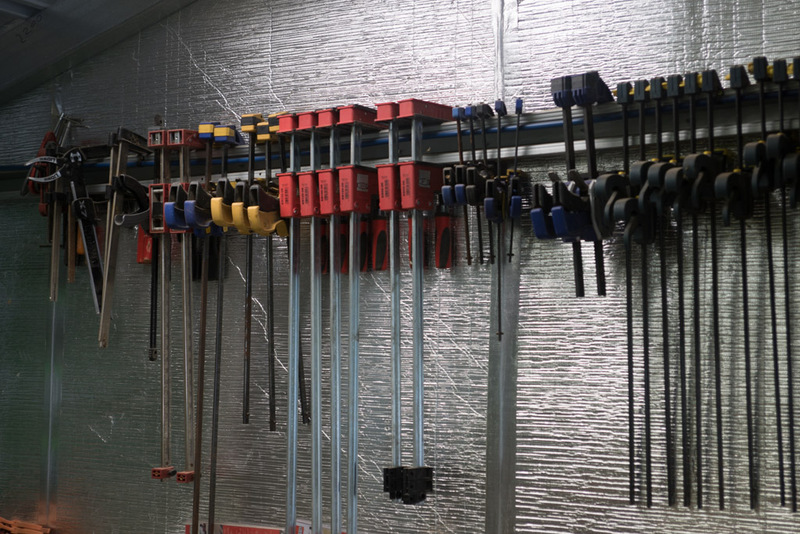 I never have to think where the closest air supply is – they are all to hand anywhere in the workshop. The system does bleed a tiny bit of air, so when charged it does add a tiny amount to the background noise, and it doesn’t stay fully charged without the compressor topping up the pressure occasionally. Not a big problem, unless I forget to turn off the air compressor – sure the neighbours love to hear it kick in, in the middle of the night! The system seems to be working ok – manual blast gates are ok, and a lot cheaper than an automated system, but it is an extra step that has to be set up each time a machine is used. 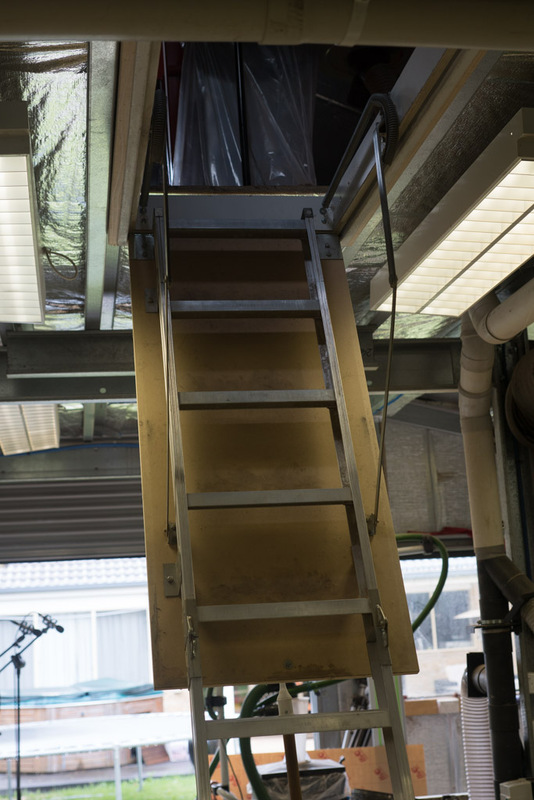 Having the extractor on the mezzanine is also ok – it is causing quite a dust issue up there from a few leaks that have happened, so containing the extractor would still be a good move. It is still in the way a bit of the stairs, and 2HP is underpowered for the size of the runs I have. But it is coping to a certain degree – filled another bag just with the work done yesterday and today, so at least that is sawdust that is not all over the shed floor. A bigger extractor would be preferable. There are still areas needing improvements out there – a long (never ending) list. 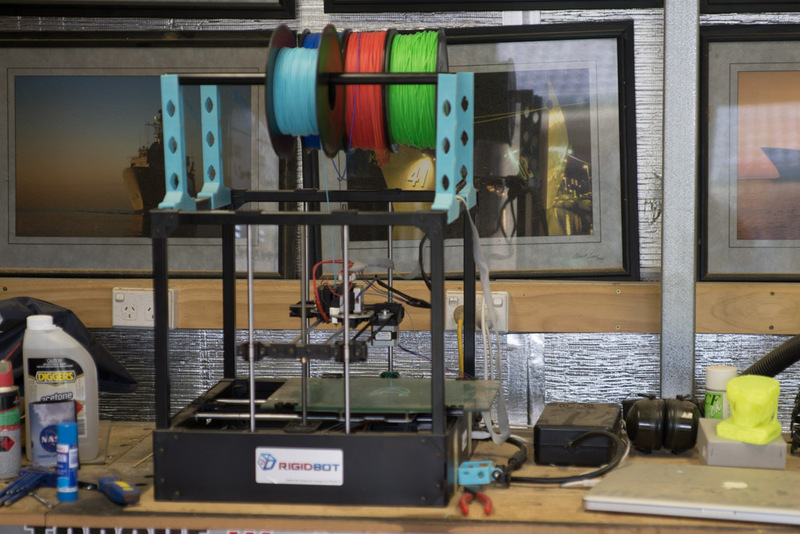 The Triton routers (primarily the one in the router table) could do with an upgrade at some stage. Initially, the speed controller is pretty much dead and needs replacement. All in all, the shed is very functional, and plenty of things are being made out there, never as often as I’d like, but I can create something in a weekend pretty easily, from toys to furniture and everything in between. And after all, a shed is a living space. The day there is not something to improve, change, add, is the day the door is shut and locked forever. The other addition 12 months ago was the SawStop tablesaw. What an amazing machine that is. The build quality is superb, it is a pleasure to use (and I just ran another 1/2 a km of timber through it today), and still that safety mechanism sits there quietly in the background. 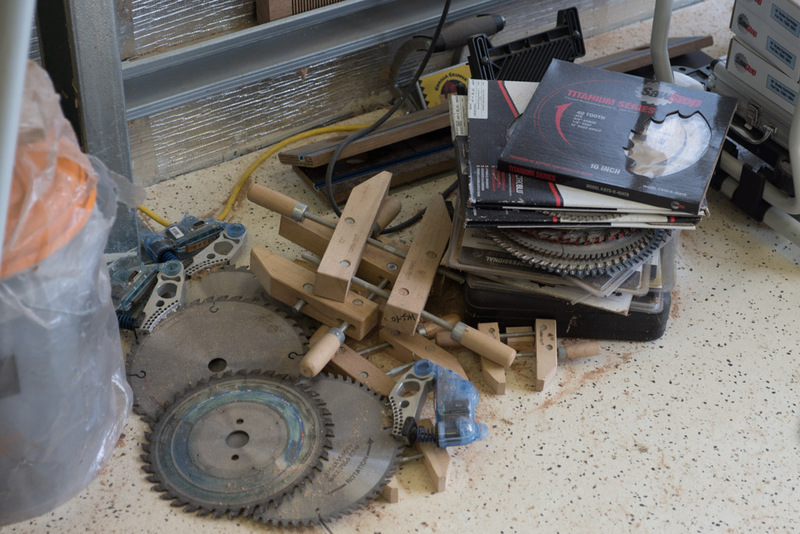 I have the wheel kit to add to the saw which I really need to do asap, and I have one of their titanium blades to try out as well. I definitely want to add the overhead dust extractor to it, and I can’t wait for the sliding table to become available! Could have really used it today. So that is the Fair Dinkum shed, 12 months on. Overall, it is a solid tick of approval. The shape works, even though it was a compromise for the shape of the block of land. More floor space is always better, but that is always the trade-off. 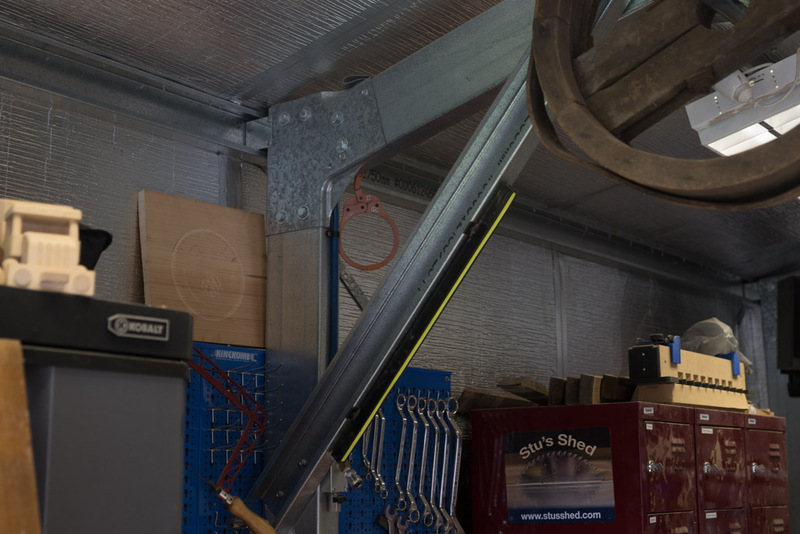 The mezzanine is a definite boon, and has really contributed to the shed remaining functional. A great home for Stu’s Shed. Here’s to 2015, and what should be a great year ahead! 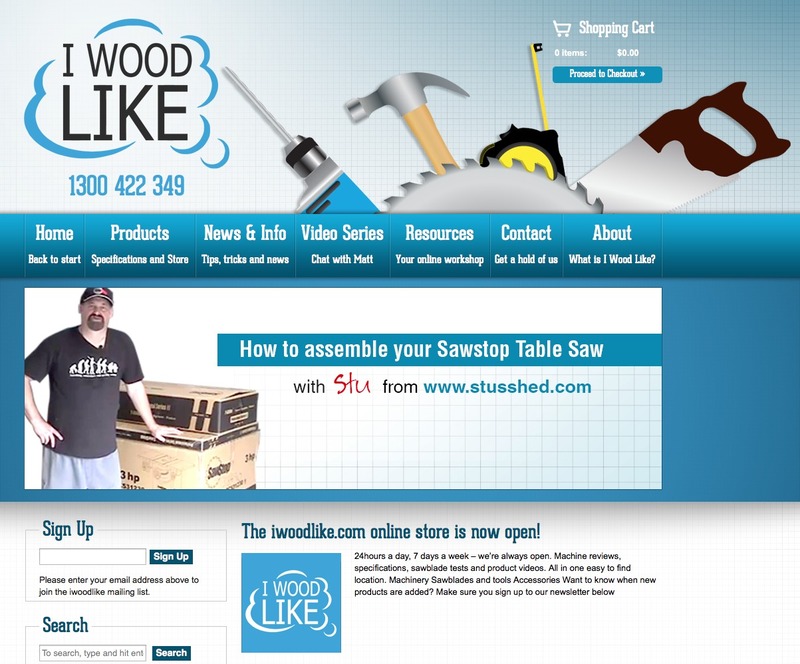 Gave the I Wood Like website a run today, specifically around their new online shopping cart. Very seamless and easy way to purchase blades, brakes, inserts, even entire machines (both SawStop and MiniMax). The blade purchased will be the subject of an upcoming review. Details of delivery address and payment details have been removed from the video, for obvious reasons!! I haven’t paid too much attention to sliding tables before, although the Sliding Extension Table on the Triton was rather handy. The latest offering from SawStop looks rather interesting, and I’ll be giving it serious consideration when it becomes available down under. No doubt it will be able to be fitted to other tablesaws. I do wonder if anything has been added to insulate the fence from the operator- I would imagine that if you cut the fence accidentally while you were contacting it, the brake would activate. In any respect, I can well see how useful an add-on it would be- very tempting indeed. 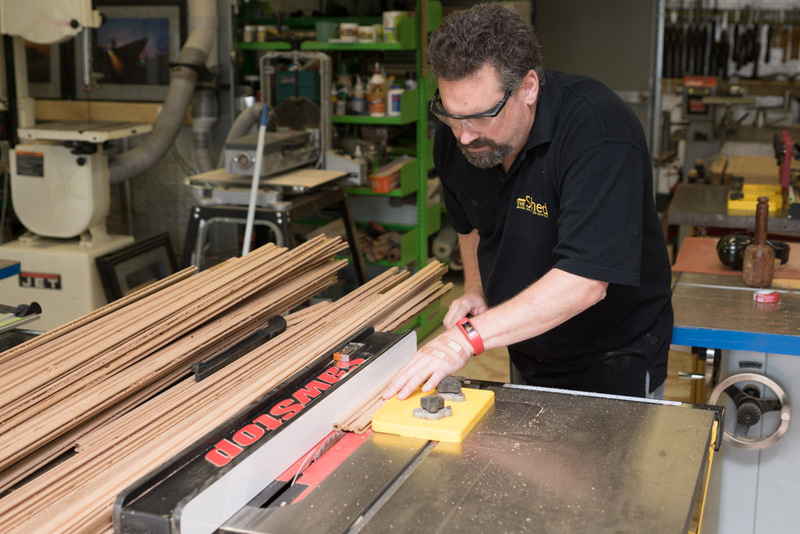 The guys down at I Wood Like have done a lot of work recently, and have done a complete rebuild of their site. It looks much like it did before, but has had a significant upgrade, especially around the new online store. 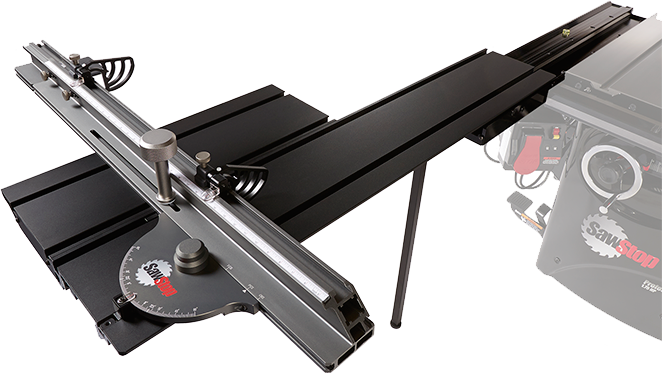 For those that don’t know, they are the importer/reseller of the SawStop tablesaw, so I have been working closely with them on the video front, providing footage about the SawStop. At this stage, they have my video of the assembly of the saw, the video of the saw in use, including the brake, and a short of the blade brake in action. Upcoming footage on their site includes my video about the guard & riving knife and using the dado blade (and a short video of the same). The next video after that will be about fitting the genuine SawStop wheel kit, which is a much better solution than the standard machine wheel kit I have been using. As the I Wood Like site grows, it will be interesting to see their next round of developments. 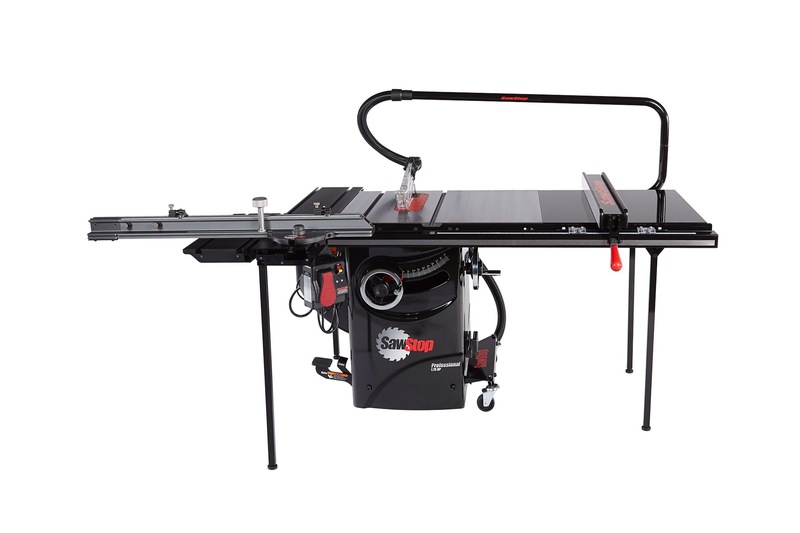 The online store that is now up not only covers the SawStop and the related accessories, but also a range of other machines, including the MiniMax bandsaw, panel saws, combo machines and more. That includes a range of BSP Blue sawblades. Not sure what they are like yet, compared to the blades I know, but will be interested to find out, and the SawStop Titanium blades measure up. Will also be interested in seeing how some of the other machines measure up to those we are familiar with. So many tools, so little time!